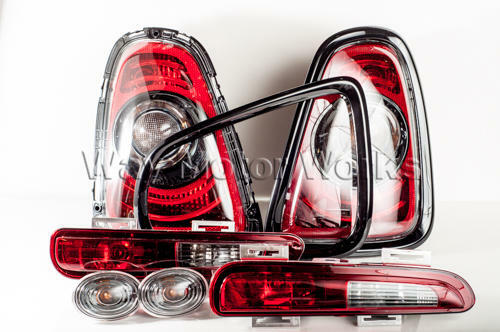 Blackout Light Kit for 2010-2013 R56 MINI, R57 Cabrio, R58 Coupe, and R59 Roadster. If you don't like chrome or the rear tail lights from the factory this kit is a must have. These Blackout tail lights have NO chrome in them. 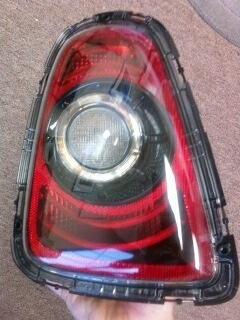 The center turn signals are also clear rather than the original lights that are black. After you install these you can install the black tail light trim rings around them. Then you can install these smoked reverse lights. They don't look much different until you install them on the MINI and then they look like the reverse lights are almost black. And the final touch is to replace the front turn signal scuttle lights. These have the back of them black with the clear lens so when you look at them all you see is the lens and bulb no chrome reflection in the back.